PrimeFaces 3.0.M3 begins with the new ThemeSwitcher component. 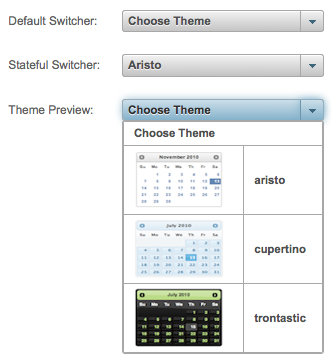 Old themeswitcher had many shortcomings, it can’t work in an offline environment since it needed a connection to load the themes and saving the selected theme on the server side was tricky. For new themeSwitcher I’ve created a native PrimeFaces widget as an extension of selectOneMenu that can load themes locally since it is an input component selected theme can be passes to the backing bean. Using optional support to client behaviors like p:ajax, more fun can be implemented. I’ve created a new example demonstrating possible scenarios with new themeswitcher in PrimeFaces Labs Showcase. ThemeSwitcher is a good component. Theme Preview is handy. That’s what I wanted to do with p:selectOneMenu. @Oleg, that is on purpose to show how crap page looks when no theme is in. It fileupload supports for Spring in PrimeFaces 3.0 final?